Preparing for advanced illness and end-of-life issues has a bit of the same connotation as perhaps diet and exercise…you know you should do it, but don't really want to. Candid discussions about death and dying aren't easy to come by and although many patients, caregivers and doctors know they are important, many find themselves avoiding these conversations. Your barrier might be as simple as having a place to start. Know Your Wishes was created to help navigate you and your loved ones through these necessary conversations by introducing new resources such as The Compass, Last Wish - Stories to Inspire a Peaceful Passing and our network of friends and partners to guide you through meaningful advance care planning. Talking about end-of-life issues is not an easy task, yet when patients, physicians and caregivers share personal stories or experiences, it seems a little less overwhelming. 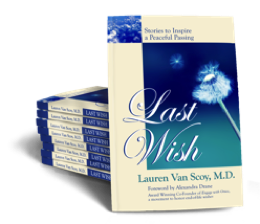 Last Wish - Stories to Inspire a Peaceful Passing is a compelling and original compilation of real life stories, written by Lauren Van Scoy, MD, an intensive care (ICU) physician. 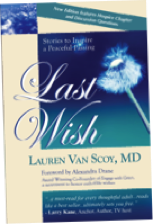 Through first hand accounts from her own perspective as well as those derived from extensive interviews with patients, nurses and caregivers, Last Wish - Stories to Inspire a Peaceful Passing paints a realistic picture of critical care and the challenges﻿ inside the ICU. Tackling topics such as life support, do-not-resuscitate orders, advance directives, ventilators, organ transplant, hospice and palliative care and pain management, Last Wish provides a multitude of important lessons that every patient and their surrogate decision maker or next of kin should be aware of; a graceful insight into this difficult finale to life.